As I drove around under the viaduct, I could indeed see action at the restaurant. Workmen were busily scurring around, saws and hammers sounding out. There certainly was something going on. An aroma of baked goods will add to vintage ambiance ranging from cinnamon rolls, pies and cornbread; edibles will include soups and salads, sandwiches, steaks, fresh fish and diet-conscious or vegetarian foods. A featured entree will be pan-fried chicken – cooked in cast iron skillets — served with fresh mashed potatoes and gravy. And everything will be homemade…. On whether Stone’s will serve dishes reminiscent of menu favorites, Badger said one thing is certain. 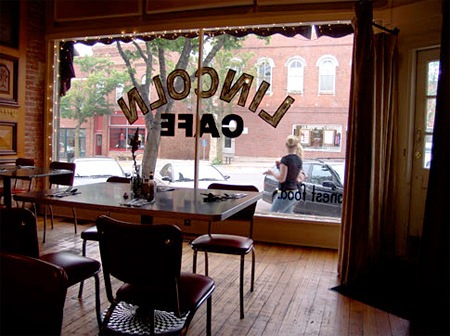 Two new online resources will ease your search for classic diners along the Lincoln Highway or anywhere. Above: Earle Hersman at the grill at Jacki and Earle’s Steel Trolley Diner in Lisbon, Ohio, a 1955 O’Mahony-brand diner. Traveling all day across Ohio, there is no bigger thrill than pulling into town, seeing the lights on 24 hours a day, and knowing you can get breakfast, dinner, dessert, or just some coffee for the miles ahead. Since starting Roadside magazine in the early 1990s, Randy Garbin has published maps to locate and identify diners, those factory-made restaurants with a counter that so many of us love. Then he compiled the info into a bound volume organized by state. Now that amazing database is available on the web at no charge: Diner Finder Online. Visitors to roadsideonline.com will find the feature in the tabs to the right and need just do a simple free registration to gain access. Once there, you click on a US state, and go to a list alphabetized by name, with city identified and an occasional picture. (Once you’re registered, you can access the site directly at http://www.dinerfinderonline.com) Fellow researchers and food lovers have already contributed dozens of updates and corrections, making it the premiere guide to some 1875 diners. The print version is still available too. Another new source for diner info is Larry Cultrera’s Diner Hotline blog, which I’m proud to say was inspired by my move to blogging. Larry has written the Diner Hotline column for the Society for Commercial Archeology’s magazine (which I design) since 1988. He took his first diner photo in November 1980, then the following July started a Diner Log. He’s up to 806 diners but seems to know every diner’s story and owners, past and present. Check it out at http://dinerhotline.wordpress.com/. The heartbreaking image at his page top shows the former Rosedale Diner of Pottstown, Pennsylvania, which appeared in 1973 on Daryl Hall and John Oates’ album Abandoned Luncheonette.